The Literature and Medicine series focuses on the human context of illness and health through multiple genres; from poems, short stories, and drama to critical essays, memoirs, and historical accounts. Titles in the series are designed to provide students, educators, and health care professionals with key texts and strategies for humanities-based inquiry. We are particularly interested in multi-authored anthologies that present the diverse experiences of illness and healing, death and dying, and the normal and the pathological for use in classrooms and other educational settings. 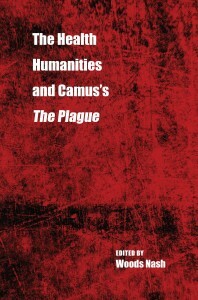 Camus’s The Plague, first published in 1947, is widely regarded as a classic of 20th-century fiction and as an interesting point of reference for the field of health humanities. Woods Nash’s edited collection of essays by diverse hands explores how The Plague illuminates important themes, ideas, dilemmas, and roles in modern healthcare, helping readers—and particularly medical students and professionals—understand issues related to their training and practice in a dramatic and stimulating context. Doctors today are struggling: debt, divorce, substance abuse, burnout, suicide. They succeed or fail on professional treadmills; patient encounters measured out with coffee spoons. The doctor-patient relationship is crumbling. Bureaucratic and corporate masters make their never-ending arguments of insidious intent. The overwhelming questions: Now where to turn? How do physicians—and their patients—avoid being crushed by the demands of science, of perfection, of expectations? How do we recover the awe we once felt in this world in which we expend our life force every day? How can we find joy once more? Curriculum committees at health professional schools are determined that faculty engage students in reflection. Reflective practice invites students to inquire into their own thoughts, biases, assumptions, feelings, and behaviors and to reconnect with their own sense of purpose and commitment to their work. In Keeping Reflection Fresh, practitioners, educators, and students in medical humanities, bioethics, nursing, emergency medicine, geriatrics, psychiatry, family medicine, surgery, medical education, and other fields join artists, musicians, poets, and writers to present an illuminating and innovative collection of provocative essays. The contributors—including Louise Aronson, Jay Baruch, Alan Bleakley, Rita Charon, Jack Coulehan, Sayantani DasGupta, Therese Jones, and Delese Wear, among many others—offer insights, guidance, and strategies designed to inspire new concepts, connections, and conversations, enrich practices, and stimulate scholarly inquiry. Nathaniel Hawthorne and Edgar Allan Poe were masters of mystery and fantasy, but they also engaged real controversies surrounding individual health, health care practice, and biomedical research in nineteenth-century America. During this volatile era, when mesmerists, phrenologists, and other pseudoscientists reigned and “regular” physicians were just beginning to consolidate power, Hawthorne and Poe provided important critiques of experimental and often haphazard systems of care, as well as insights into the evolving understanding of mental and physical pathologies. As writers, they responded to the social, historical, and medical forces of their own time, yet they also addressed themes of bioethics, humanism, and patient-centered care that remain relevant in the twenty-first century. Conventional medical narratives often fail to capture the incoherent, surreal, and logic-twisting reality of the contemporary healthcare experience, where mystery, absurdity, and even cruelty are disguised as logic, reason, and compassion. In this new collection of stories by physician and writer Jay Baruch, characters struggle in their quest for meaning and a more hopeful tomorrow in a strange landscape where motivations are complex and convoluted and what is considered good and just operates as a perpetually shifting proposition.